If ever there was a time for courage, it's now. In The Courage Companion, the co-authors of the bestselling Living Life as a Thank You present stories of extraordinary fortitude. These true tales not only invite the reader to "tap into-and hold onto-our inner strength when times get tough and when we're feeling all alone" but also act as guides to inspire anyone to just do it, whatever the "it" may be. 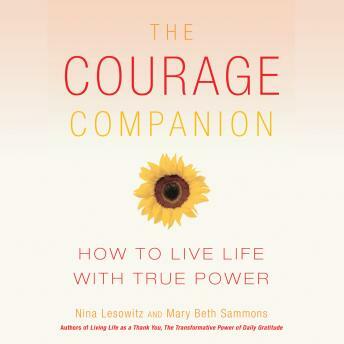 Authors Mary Beth Sammons and Nina Lesowitz have voyaged the front lines of adversity and fear to find the brave hearts who confronted and overcame obstacles in ways that inspire us all. From world-class athletes to business and humanitarian leaders, and from cancer patients to ordinary people who took extraordinary action to transform their lives, these courage warriors will show you how to turn apprehension into action. Enriched with motivational quotes, expert advice, and power practices, this courage guidebook will show you how to live your life with guts and gusto.